Coal power is set to soar as the region’s energy demands are expected to multiply in the coming years. According to a report released by the International Energy Agency (IEA) in October last year, Southeast Asia’s energy demands are forecasted to grow as much as 60 percent by 2040. This increase in energy demand is led by a growing population. Higher incomes in the region also means consumers are buying more electric appliances and increasing their consumption of electricity. The report also mentions that the region can expect universal access to electricity by the early 2030s. As demand for energy increases every year, a number of Southeast Asian countries are relying on coal as a cheap way to meet their energy needs. The IEA report shows that coal will account for almost 40 percent of the growth in energy demand in the region, overtaking gas in the overall energy mix. In other parts of the world, coal is slowly dying out. 20 countries have agreed to phase out coal at the United Nations (UN) Climate Change Conference last year. However, it doesn’t seem to be the case for Southeast Asia. At the moment – according to another report by IEA titled “Key World Energy Statistics” released last year – data compiled shows that Indonesia is the largest producer of coal in the region and the fifth largest producer of coal in the world. Meanwhile, Malaysia and Thailand are the highest importers in the region, and are ranked ninth and tenth, respectively, in the world for coal imports. Vietnam is also a major coal user, with coal powering 40 percent of the nation’s electricity. The Vietnamese media revealed that the government’s power development plan will see coal power rise to 49 percent of Vietnam’s total energy mix by 2020 and 55 percent by 2025. 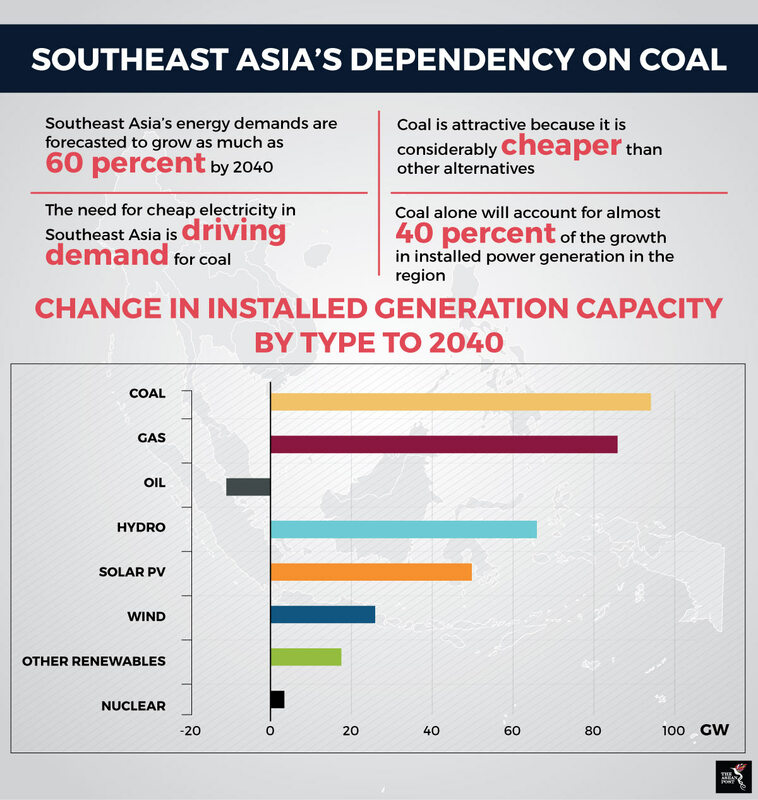 In an analysis by the Institute for Energy Research, many Southeast Asian countries are attracted to coal due to its affordability. Compared to other fossil fuels and renewables, coal is much cheaper. The cost of setting up infrastructure for coal is also not as capital-intensive as other alternatives. In 2016, Harvard released a study showing the impact of planned coal power expansion in the region. The study revealed that approximately 20,000 people in the region die every year from coal-fired power station emissions, and this figure is expected to go up to 70,000 by 2030 if all the proposed power plant projects in the region go forward. Coal may save money in the short run, but future generations will have to pay a heavy price for it. ASEAN member states have taken steps to mitigate the effects of coal and have made great strides towards using clean energy in the region. While the use of coal may be on the rise, Southeast Asia’s renewable energy will also have an increased share in the region’s energy mix. It is forecasted that renewables will account for 40 percent of installed capacity by 2040. ASEAN has also set a target of securing 23 percent of its primary energy from renewable sources by 2025. Southeast Asia’s climate and landscape is actually ripe for renewable and clean energy. The region has great rivers for hydroelectricity, enough wind to generate wind energy and receives enough heat for solar power creation. In fact, if done right, renewable energy should account for the highest share in the region’s electricity production. As the world moves towards consuming less damaging resources such as natural gas and renewable energy, Southeast Asia has the potential to catch up as its climate and landscape are naturally suitable for renewable and clean energy. The only element left wanting is a strong collective political will.